At least they weren’t stupid enough to get each other’s names! Kylie Jenner and boyfriend Travis Scott must be getting serious, because they just got matching ink! 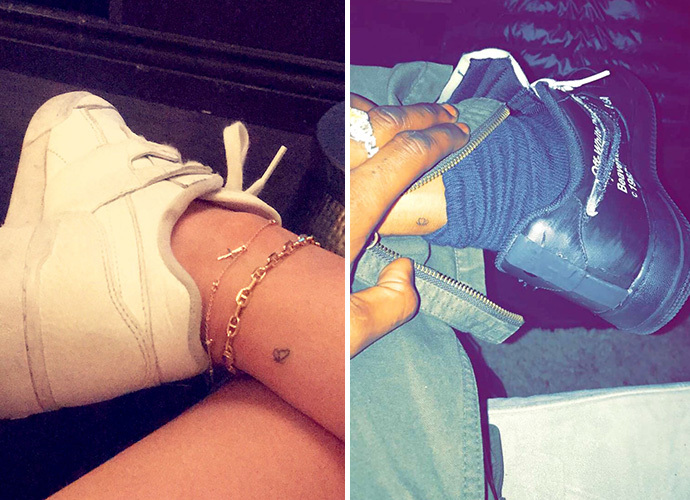 The reality star and the rapper both got small butterfly tattoos on their ankles, and we’re wondering if it has a special meaning, or they just like the insect? One thing’s for sure… the LipKit queen is officially over Tyga! The one hit wonder is pissed, too. “Tyga’s ego is so huge, he still can’t seem to comprehend that Kylie [Jenner]’s over him. He used to brag that he could get away with anything and she’d never get over him, but clearly that’s not true. Instead of facing the facts, Tyga’s being super childish and trash talking Travis [Scott]. He makes fun of his style and calls him soft, but he’s obviously jealous that Kylie’s moved on — he can’t let go,” a source dished to Hollywood Life. “He’s rewriting history and obsessing over Kylie cheating on him with Travis, 25. He’s convinced there was an overlap and that Travis stole his girl. At the same time he’s trying texting Kylie begging her to see him again. He still thinks he can get her back, he won’t accept that she’s moved on,” the source added. We’re glad the plastic surgery princess finally kicked T-Raww to the curb!